Thrifted to Gifted. What to do with All those Beautiful Frames You Find at Yard Sales and at Second Hand Shops: a DIY Jewelry Display. Mom has been heaping her earrings in a cardboard egg carton since we downsized from her standing jewelry box. It was a great temporary solution but, it has long ago outlived its usefulness. Time for an upgrade. 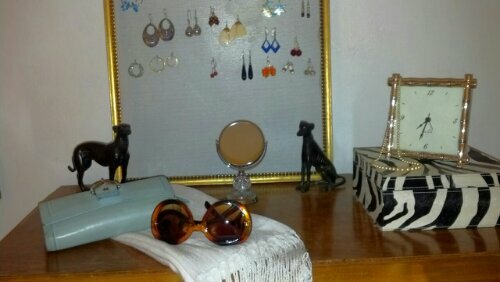 I wanted to display her collection out in the open yet be functional for her Hollywood glamour inspired room. 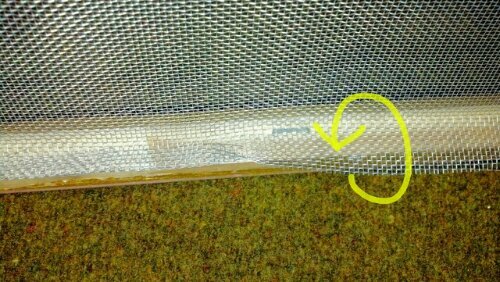 * Window screen mesh, enough to cover the frame that you’re going to use. * Picture frame. Wood works best. No glass or backing required. 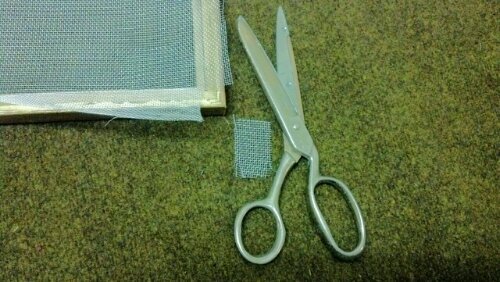 * Pair of old scissors, as they will dull if cutting screen mesh. * Padded work surface (blanket and floor). * About an hour of your time. The assembly is fairly straightforward. 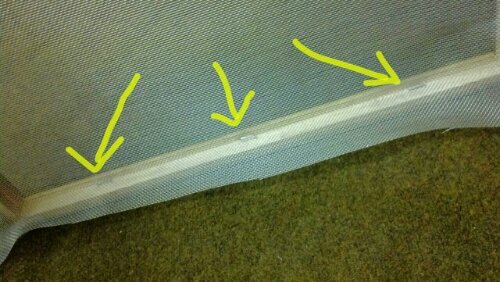 Trim window screen with 1 inch allowance on all sides. 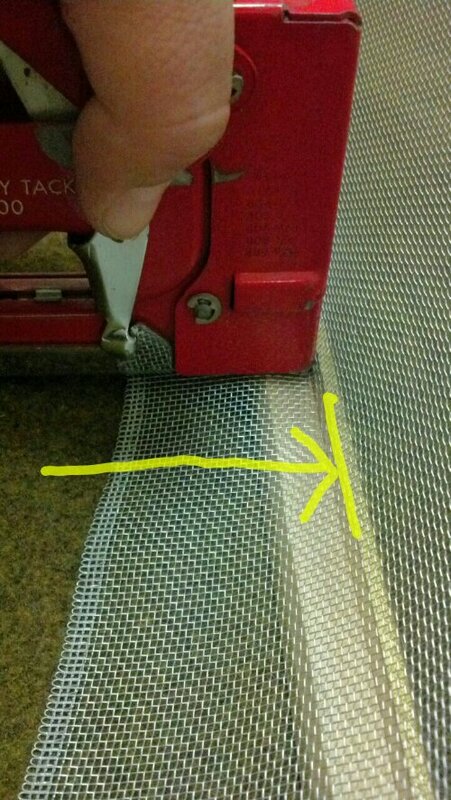 Begin by tacking the screen down with one staple at the center of each inside gutter of the frame. This is the one chance that you have to center and align the screen. Remove staples with flat head screwdriver to readjust. Now, you can begin to secure with more staples, evenly. 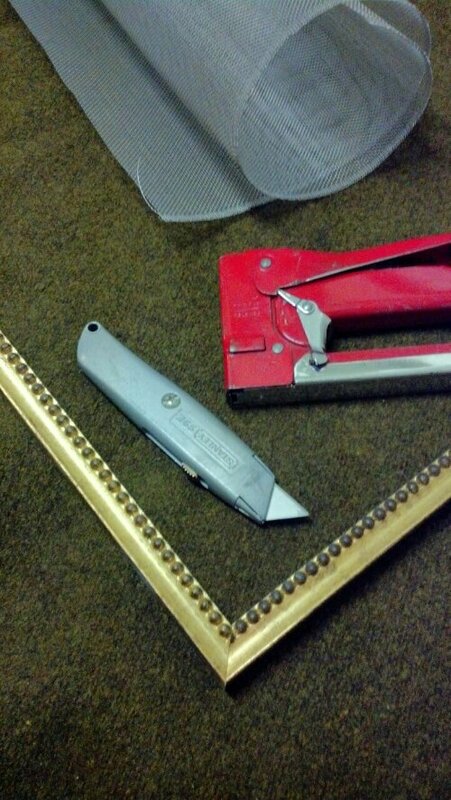 Remember to keep tension on the screen as you add staples. However, not so much tension as to make the screen buckle or bubble. It helps if you alternate opposite sides while adding staples to maintain proper tension. 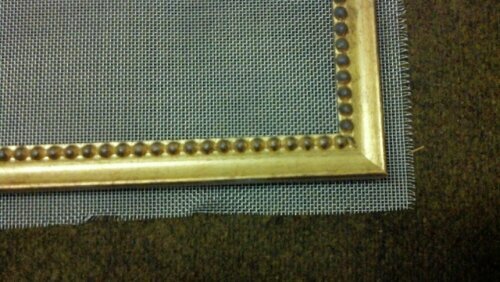 The larger the frame the more staples will be required. Do not add too many staples as you will be adding more later. 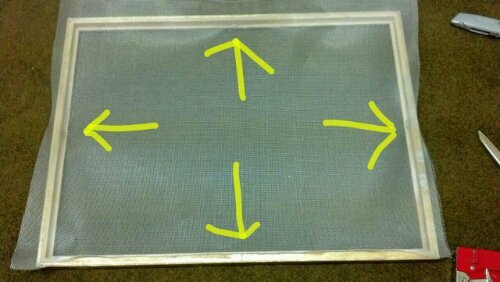 Once you have secured the screen smoothly, use scissors to remove each corner , as shown in the picture. This will insure that you will not have a bulky corner when finished. Note: you may find that you need to trim the screen edge a little more. The allowance should now be no greater than twice the size of the width the frame gutter. 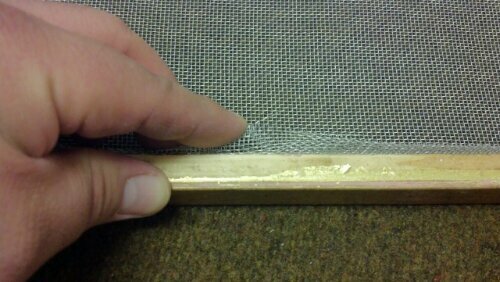 Using your hands, being careful, begin folding the rough edge the screen over onto itself. Add more staples to secure. This should create a smooth outside folded edge. Repeat on all sides. This is a fun gallery inspired way to display a jewelry collection. I also made a small 5×7 stand up frame for her studded earrings as they need to be handled from both front and back, often. Now I know what to do with all those great frames I find at the thrift stores or yard sales. These would make great gifts. 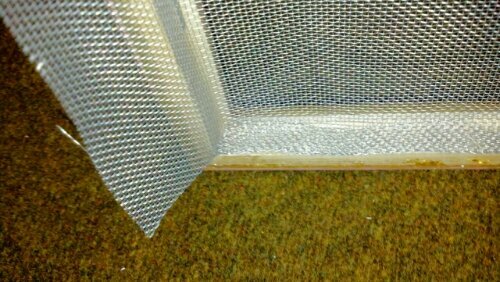 • Larger hole size chicken wire would be a great alternative, for scarfs storage.
. . . or perhaps for cloth napkins in the kitchen or dinning room. 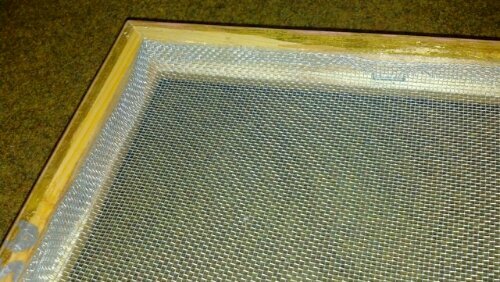 • Paint the screen for a more modern treatment. • Embroider the mesh for a more folk art feel. • Half mirror, half screen. 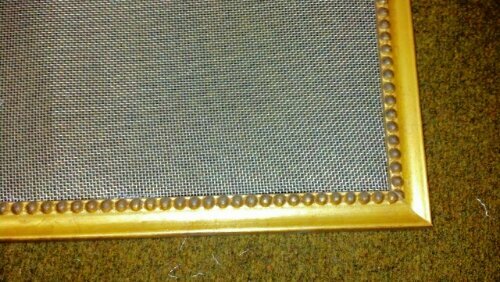 • Also cutting shapes from screen, crimping edges and tethering to larger frame with ribbon may work for stud earnings. "I believe the need to make and create is inherent. Self-made, if you will!" This entry was posted in Display, Organization, Uncategorized and tagged collections, heirloom display., in plain view storage, jewelry display, old picture frame, personal organization, small space storage. Bookmark the permalink. 1 Response to Thrifted to Gifted. 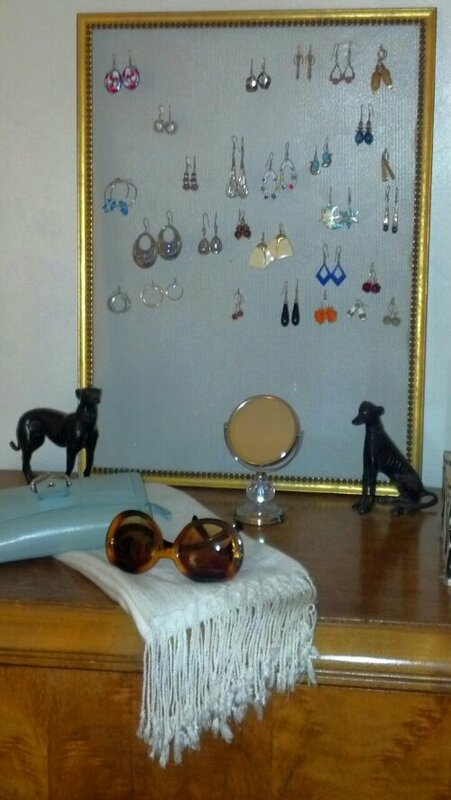 What to do with All those Beautiful Frames You Find at Yard Sales and at Second Hand Shops: a DIY Jewelry Display. Restoring a Beloved Family Vintage Lamp or I’ve Been Putting this Off Because I Thought it was Going to Be More Difficult.